As the movie Jurassic World prepares to introduce a new generation to the menacing magnificence of dinosaurs, a recent discovery in Colorado appears ready to add an amazing and unexpected degree of reality to that film’s fictionalized account of prehistory. It seems that 90 million years before the legendary Tyrannosaurus rex terrorized its Cretaceous landscape, an even larger and more powerful carnivorous dinosaur known as Torvosaurus was the unquestioned ruler of a real Jurassic world. With huge jaws filled with six inch long serrated teeth, scythe-like claws and an imposing size that allowed it to dominate its realm, some 150 million years ago, Torvosaurus was truly the King of Beasts. Back in 2012, paleontologist Jason Cooper uncovered a horde of huge dinosaur bones at the privately-owned Skull Creek Quarry in Colorado’s famed Morrison Formation. At first, Cooper wasn’t sure how much of the dinosaur he had uncovered, or even what kind of dinosaur it was, but he immediately sensed this was something different… and something important. It took countless hours over the next three digging seasons to free the various bones from the ground, all still safely encased within their surrounding rock matrix. A veritable treasure trove of bones was eventually uncovered, a disarticulated puzzle of gigantic proportions that needed both additional expertise and labor before Cooper, or anyone else, knew exactly what had been found. Unless you earn your living working as a vertebrate paleontologist at a leading museum or university, you’ve probably never heard of this Mesozoic monster. In all honesty, up to now there’s been no particular reason for the name Torvosaurus (which translates to “savage lizard”) to have entered the popular lexicon, especially since no complete example of this fossilized beast has ever been found. Indeed, only scattered bits of bone and teeth have so far comprised our storehouse of known material, making this one of the most mysterious of giant prehistoric predators. Yet judging by the size and quantity of bones from this Torvosaurus specimen which has been nicknamed “Elvis” (it is, after all, a “King”), this amazing creature probably reached a size over 40 feet in length, larger than any known T rex. Unearthing this beast was only the first step of the process, however. 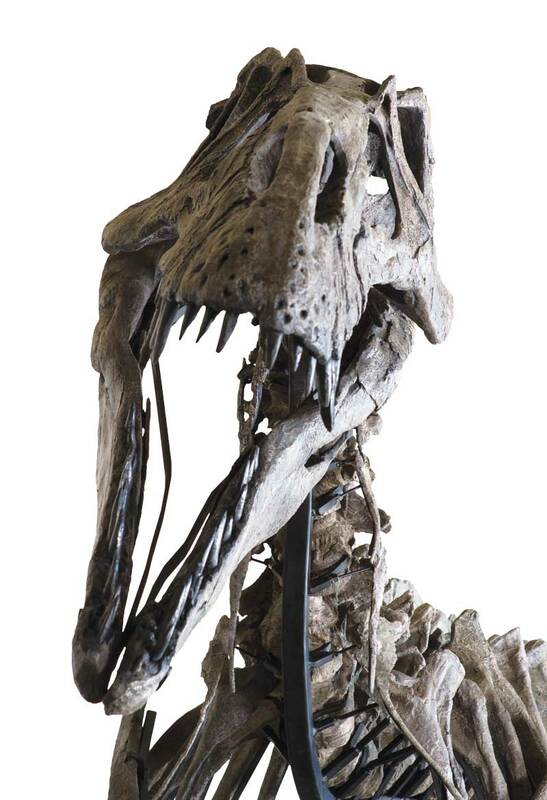 The task of assembling this monstrous Torvosaurus skeleton fell on the shoulders of Brock Sisson of Fossilogic, a Utah-based company geared for the discovery and preparation of dinosaur fossils. There, a team of workers toiled for months, carefully exposing the fossilized bones from within their sedimentary encasements and then placing the freed specimens on a steel armature in a manner best reflecting the latest scientific thought regarding the posture of “living” dinosaurs. When their task was completed those involved were astounded by what they saw… the Torvosaurus was approximately 55 percent complete (a high number in dino-terms), presenting a surprisingly detailed look at one of North America’s most secretive Jurassic beasts. Not only were the huge pelvic and hind limb bones of the Torvosaurus present, but so were complete associated backbones which for the first time made possible an accurate estimate of the dinosaur’s immense size. 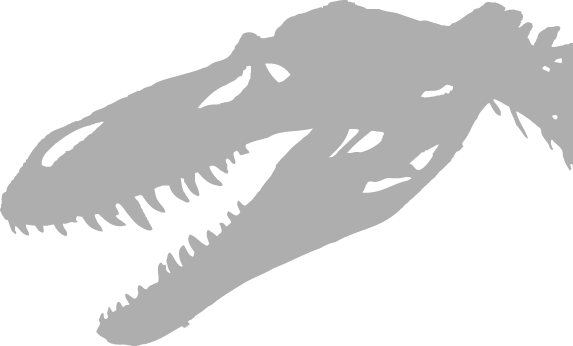 Even more importantly, both maxillary and cranial elements of the Torvosaurus’ skull had been recovered. These bones are of particular scientific importance, and showed that this skull measured nearly 52 inches in length– comprising an astounding 18 percent of the dinosaur’s total size! Science has long known that theropod dinosaurs were the largest carnivores ever to walk on the face of Planet Earth, yet this specimen of Torvosaurus amazed paleontologists around the globe by proving it was the largest Jurassic theropod ever found. Prior to the efforts of Cooper and Sisson, Torvosaurus had been previously known only from a handful of relatively small, isolated pieces found scattered throughout a very specific layer of the Morrison formation. These finds had only provided tantalizing clues as to the creature’s true size, shape and status within the Jurassic world. 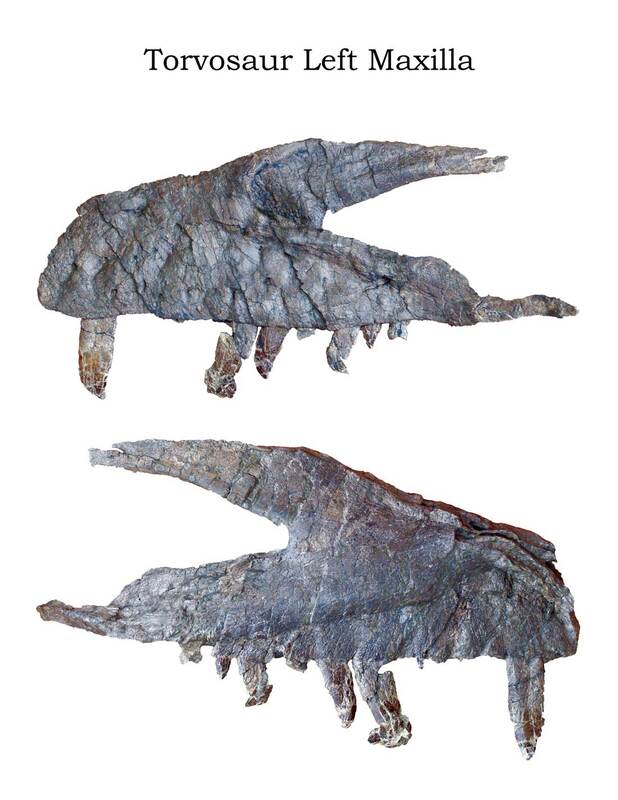 The Elvis specimen, prominently featuring the animal’s saber-like teeth, has already revealed more information than scientists could have previously imagined about one of the Jurassic’s most elusive and enigmatic predators. Cooper hopes that this Torvosaurus find will go a long way towards opening up new windows for scientific advancement as well as greatly increasing public awareness of the creatures that roamed our planet during the incredibly distant past. Renowned paleontologists from throughout the world have expressed interest in the specimen and are expected to view the skeleton after it is mounted for display. There is even hope from Cooper and the folks at Fossilogic, who together own the Torvosaurus specimen, that one of these institutions may step forward with an offer to provide Elvis with a permanent home. 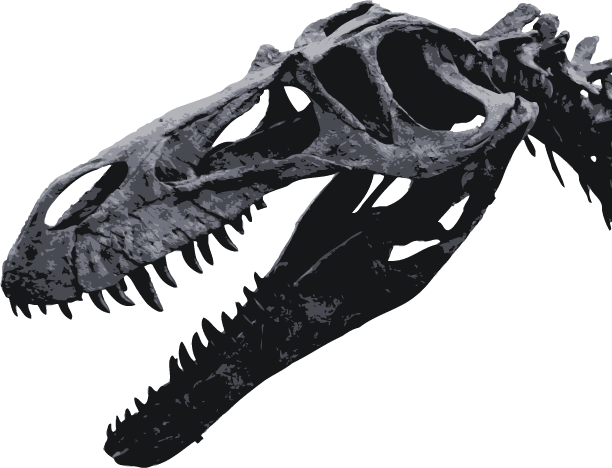 In the meantime, excavations at the Skull Creek Quarry are on-going, with expectations that additional Torvosaurus material (perhaps even from the Elvis skeleton, itself) will soon be unearthed, potentially adding even more information to what is already emerging as one of the most exciting and scientifically important dinosaur discoveries of all-time. Indeed, in light of this Torvosaurus discovery, it seems as if Jurassic World may have chosen the wrong “monster” (the fictitious Indominus rex) to be the star of its film! For information about acquiring this specimen, please complete this form or contact us directly. Serious inquires only.